This material handling and storage system is customizable to whatever you may need to store. The Rotomat Industrial Storage Carousel is designed like the “Ferris wheel” concept model. The automated system rotates around making the shortest route to bring an item to the end user. The user no longer has to find the item they are looking for without having to stretch, bend, lean or reach for an item stored otherwise. Therefore, Time is saved. The unit runs smooth and quiet with duel motors on either side of the carousel system. Money is saved. By utilizing room height and the carousel’s compact construction design, over 60% storage capacity is utilized in a small footprint. Each industrial vertical carousel is custom built per spec and design. There are no two places with the same exact storage challenges. 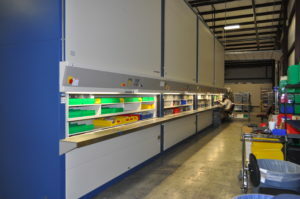 Each unit is designed to accommodate the size of items stored whether it may be small parts, tools, medical devices, laundry, computer parts, mail or bulk items like motors and gears. To access the unit, the operator enters location information which may be the row or bin unit. The storage system then quickly delivers the that bin to the opening in the front of the unit. It is a computer numerically controlled system that makes it simple to retrieve the appropriate item. Size and weight both factor into the design of the unit itself. There are numerous possible accessories that can be used such as containers, bins, small part trays, divides, inserts and tool holders. Check out this video to learn more about saving space and time. Check out Hanel’s literature piece here for more information. The Lockomat is a model used for extra security. The openings or individual bins can have locked doors on each item with controlled access. Users with this storage system only has authorization to retrieve items stowed away in the locked bins by using an ID card, password or transponder. The user interface set up for themselves personally appears on the display. This safety ensures no users without authorization can retrieve items in these locked bins. Everything taken from these bins can be traced to a specific user to provide the utmost security in your facility. Anything requested or put into storage is done by entering an article number or using a barcode scanner. Digital LED displays on the work surface to indicate the compartment door where the article is stored. Check out Hanel’s literature piece here for more information. Contact a local BSC rep at 205-988-3300 for more information and learn how industrial vertical carousels can bring space saving, time saving, and efficient productivity to your workplace.